Australian Wildlife Services is helping traditional owners of the Angkum homelands, Cape York Queensland to develop a plan of management for the proposed Angkum Indigenous Protected Area (IPA). 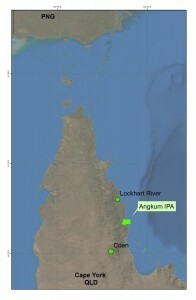 Angkum Homelands are on the east coast of Cape York Peninsula, about 80km south of Lockhart River, at about 13 degrees south of the equator in the Cape York Peninsula biogeographic region. Angkum want to maintain and restore the integrity of the land and sea environments of the Angkum homelands, as well as sustain the interaction between Angkum people and their natural resources. Australian Wildlife Services will work with traditional owners of this unique environment to deliver their dream and aspirations for management and monitoring of Angkum IPA and combining traditioanl ecological knowledge with science. Importantly, traditional owners will be establishing a visitor protocol for visitors to Angkum homelands and IPA which will enable rangers and the IPA manager to enforce correct use of thier lands and sea country.